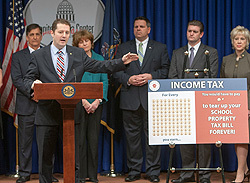 HARRISBURG – Remaining committed to her fight against the outdated property tax system in Pennsylvania, Rep. Karen Boback (R-Columbia/Luzerne/Wyoming) on Tuesday joined a bipartisan group of lawmakers at the state Capitol as they reintroduced House Bill 76, known as the Property Tax Independence Act. The Property Tax Independence Act would replace revenues currently collected through school district property taxes with alternative, statewide funding sources. The state sales tax would be raised from 6 percent to 7 percent, which would cost Pennsylvania customers one additional penny per $1 of taxable goods they purchase. Measures under this legislation would raise the Personal Income Tax from from 3.07 percent to 4.34 percent, costing Pennsylvania workers approximately 1 ¼ pennies for every $1 they earn. Additionally, this legislation, if enacted, will close some special interest loopholes in the Sales and Use Tax. According to this bill, by combining this plan with existing gaming revenues, these dollars would be enough to fully replace school district property taxes. House Bill 76 now awaits consideration in the House Finance Committee. State Sen. David Argall (R-Berks/Carbon/Lehigh/Monroe/Northampton/Schuylkill) also introduced this legislation as Senate Bill 76 across the hall in the other chamber of the General Assembly. For more legislative information, including additional information on House Bill 76, visit Boback’s website at RepBoback.com.